The election commission’s early-morning announcement amounted to a startling admission by the government that Mr. Kabila’s candidate had suffered a defeat so big that his government — in power for 18 years — could not simply hand him the presidency without risking widespread violence and international condemnation. Mr. Tshisekedi had trailed another opposition candidate, Martin Fayulu, according to surveys taken shortly before the Dec. 30 vote. 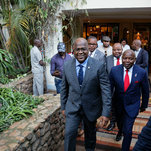 Outside observers and institutions also considered the real winner to be Mr. Fayulu, given voting data that was compiled by the Roman Catholic Church, one of the few trusted institutions in Congo. The National Episcopal Conference of Congo, a Catholic bishops group, sent 40,000 observers to voting stations across the country. On Wednesday, as the Congolese awaited an announcement about their next leader, a Washington-based advocacy group that focuses on Africa, the Enough Project, issued a warning. “Civil society, church, and opposition leaders express serious concern that the electoral commission will announce a fraudulent result,” the group said in a statement. Last week, the bishops group said data from polling booths had showed a clear winner, but it stopped short of identifying him because it did not have the legal authority to do so. Instead, the group demanded that the electoral commission, largely seen by the public as an extension of the government, publish accurate results. Even though the bishops group did not name the victor, officials who spoke in private with church officials said that the group had identified Mr. Fayulu as having won. In the run-up to the election, a number of surveys suggested that if the elections were free and fair, Mr. Fayulu would be the favorite. Opinion polls showed him with 47 percent of support, ahead of 24 percent for Mr. Tshisekedi and 19 percent for Emmanuel Ramazani Shadary, President Kabila’s handpicked successor. Riot police officers were positioned around Kinshasa, the capital, including near the election commission. Because of the threat of violence, the United States Embassy urged Americans to leave the country. Electoral observers from South Africa said that the vote had gone “relatively well,” given the relatively low level of election-related violence across a country almost as big as western Europe. But a Congo-based observer mission, Symocel, said that there had been “major” irregularities, including people tampering with results or counting centers that did not post vote tally sheets in view of the public, as required by law. The United Nations Security Council is to meet on Friday to discuss the election. The vote was marred from the beginning. The election was delayed by two years as President Kabila tried to change the Constitution to allow him to stay in office beyond the two-term limit. He broke a promise to hold elections in 2017. As he clung to power, security forces sprayed protesters with bullets and detained hundreds as the government attempted to quash any resistance. Mr. Shadary, the former interior minister who was backed by Mr. Kabila in the election, was recently placed on a European Union sanctions list for brutally suppressing protesters in 2017. Last year, Mr. Kabila stunned the country by agreeing to not run in the 2018 elections. He then announced his chosen successor, Mr. Shadary, on the last day for candidates to register. Still, in a recent interview, Mr. Kabila would not rule out returning to power in the future. The electoral process was further muddied after the government refused to allow major Western electoral observers and international donor funds to take part. In what struck some as the coup de grâce, in the week before the election, a mysterious fire destroyed election materials in a depot in Kinshasa. The electoral commission used the fire as reason to postpone the vote for a week. In the same week, it also said violence and an Ebola outbreak in the east and the southwest were grounds to exclude voters there. They make up some 4 percent of the electorate. In the 10 days since the vote, speculation has been rife about back-room negotiations that could transfer power to Mr. Tshisekedi. He is the son of a charismatic leader, Étienne Tshisekedi, who died two years ago and whose name still resonates widely across the country. “The regime could envisage a deal with Tshisekedi for several reasons,” said Adeline Van Houtte, an analyst at the Economist Intelligence Unit. For Mr. Kabila, Ms. Van Houtte said, a Tshisekedi presidency “would be easier to manage than a Fayulu presidency,” which would be “worst case scenario” for his ruling coalition. Mr. Fayulu “has no intention of protecting Kabila’s regime,” Ms. Van Houtte said, adding that he has been leading anti-government protests and is considered an “extremist” by the regime.